In the West since the eighteenth century, political change has often been stimulated by protest songs. In recent decades, Joan Baez made "We Shall Overcome" into the American civil rights movement's anthem. In Portugal, the singer-songwriter Zeca Afonso became the mouthpiece for opposition to the Salazar regime. In Poland, Jacek Kaczmarski, a singer and poet, became the voice of the Solidarity movement. This sort of protest has been limited in the Muslim world where authoritarian regimes harshly repress public challenges. However, one outstanding example of a dissident singer-songwriter comes from Algeria. Ferhat Mehenni (1951-), a Kabyle musician and politician, is a cofounder (2001) and president of the Mouvement pour l'Autonomie de la Kabylie (MAK), the only large-scale secular party standing in opposition to the current Algerian regime and calling for a federal democracy based on the U.S. model. Kabyle activists describe Islamism as a totalitarian movement and argue that the most effective response to it is the creation of a free and democratic society. Almost from the moment of Algerian independence in 1962, the northern region of Kabylie has been subjected to heavy-handed repression by successive governments. From the late 1960s, President Houari Boumediène banned its language, the Berber Tamazight or Taqbaylit as part of his government's official Arabization program, and it remained suppressed by the country's ruling National Liberation Front until 2002, when a constitutional amendment put it on the same footing as Arabic. Mehenni earned a degree in political science before embarking on a musical career in 1973. He quickly acquired a reputation as a protest singer, turning his wrath on both the government and Islamists. For his pains, he was arrested thirteen times, imprisoned for three years, and tortured by government operatives. Like the internationally famous Kabyle singer, Souad Massi, he has frequently been the object of death threats from Islamists. In 1994, his Air France flight to Paris was hijacked by an Islamist commando: He had been targeted for assassination but escaped because he was not recognized. In that year, Raï singer Cheb Hasni was gunned down in Oran, and in 1998, a Berber protest singer Matoub Lounés, "the Bard of Kabylia," was assassinated, both, in all likelihood, by Islamists. Mehenni's 19-year-old son Améziane Mehenni was assassinated on a street in Paris in 2001, seemingly because he was mistaken for his father. 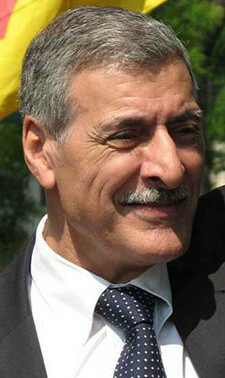 Despite these attempts to restrict his advocacy of Kabyle autonomy, Mehenni has acquired an international reputation. In May 2009, he spoke before the United Nations Permanent Forum on Indigenous Issues where he condemned Algerian policy outright and asked, "Is there a genocidal intention against the Kabyle people at the top of the Algerian state?" The idea is to democratize all Middle Eastern states in order to eradicate the sources of terrorism and preempt a future "clash of civilizations." Given time, this should lead to much greater respect between people, on the basis of democracy and liberty. It may be naïve of me to say so, but the Americans can, at least, be thanked for laying out their goal forthrightly, so surely it's worth our giving it a shot. I have no connections with Israel, but I hope that my country will stop dramatizing relations with this state … Algeria has very normal diplomatic relations with countries who behave much more scandalously than Israel in the field of human rights and that doesn't [need] to shock anyone among us. … It is time that we knew, even ourselves, that on an international level we have neither friend nor enemy, only interests." Roger Kaplan, "Democracy in Algeria," The Weekly Standard, June 16, 2003. "Arabization," Country Studies (Washington, D.C.: Federal Research Division of the Library of Congress, U.S. Department of Army), accessed Jan. 25, 2010; "Le colonel Houari Boumediene," Amazigh World.Org, accessed Jan. 25, 2010, excerpted from Ali Guenoun, Chronologie du mouvement berbère, un combat et des hommes (Casbah, Alger, 1999). "Ferhat Mehenni Imazighen Imoula," La Kabylie.com, accessed Jan. 25, 2010. Ferhat Mehenni, speech before the United Nations Permanent Forum on Indigenous Issues, Kabylia Info, May 26, 2009. "Singer-activist Ferhat Mehenni's campaign for liberal self-government," Kabylia Info, June 22, 2009. "Forum Le Matin: Ferhat Mehenni répond á vos questions," Oct. 24, 2007. Related Topics: North Africa | Denis MacEoin | Spring 2010 MEQ receive the latest by email: subscribe to the free mef mailing list This text may be reposted or forwarded so long as it is presented as an integral whole with complete and accurate information provided about its author, date, place of publication, and original URL.